Serve sides and entrees with this CAC R-3-Y Rainbow 12 oz. yellow rolled edge stoneware pasta / soup bowl. Perfect for serving pasta dishes, soup, or hearty stews and chowders, this pasta / soup bowl is a versatile addition to your establishment. You can also use it to serve large entree salads to expand your menu offerings. Ideal for cafes, diners, hotels, and catered events, this bowl is a great addition to your dinnerware collection. 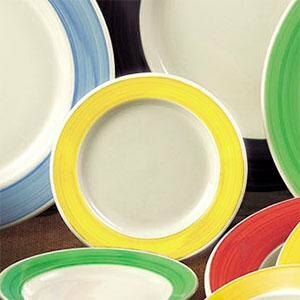 Featuring an attractive, bold yellow rim, this bowl frames each menu offering for an eye-catching place setting. The traditional rolled edge design also creates smooth edges for a professional presentation. Made of stoneware, this item is an economical, durable piece of dinnerware. Plus, it stands up against breakage, chipping, and scratches commonly caused by the wear and tear of every day use. As a part of the CAC Rainbow collection, you can mix and match plates, platters, and mugs for fun, festive table settings and serveware!